Babies have thinner skin and underdeveloped melanin (the body’s own defense against the UV rays) and therefore have to be kept out of the sun whenever possible, especially during peak times 10 AM to 4 PM. This is even more imperative since babies should not use sunscreen before they are 6 months old. Plus babies can’t regulate their body temperature the way adults can and can overheat much more easily and quickly – one more reason to keep them out of the sun. Look for clothing and hats with a built-in UPF of 30 or more. A light, white cotton T-shirt is not enough to shield baby’s skin adequately from UV-rays. Thicker fabric is more protective, but you also want to make sure that your baby won’t overheat under thick clothing. Sunscreen, especially chemical sunscreen is a big no-no for babies under 6 months. However, if there is no way to stay out of the sun, sunscreen can be applied in small doses at 3-4 months, but it has to be baby-appropriate sunscreen (read below). For example, your baby is mostly covered by clothing and stroller canopy, but the feet are still exposed. In that case, it makes sense to apply a sunscreen to the exposed areas, as long you also keep an eye out for any skin irritation. Avoid putting on too much sunscreen on the hands. Babies will inevitably put their hands in their mouth and rub their eyes. 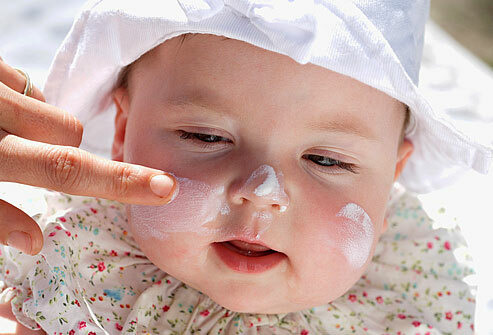 Sunscreens that are safe for toddlers may not be safe yet for infants. Look for sunscreens that rely solely on non-chemical sunscreens like Titanium Dioxide and Zinc Oxide, and if you are not sure, speak to your pediatrician, dermatologist or pharmacist. Chemical sunscreens may not only irritate baby’s delicate skin, they are also absorbed into the bloodstream through the skin. This is a problem for babies, since they have so much surface area, i.e. skin, relative to their body mass. So relative to their weight, babies can absorb a lot more chemicals through their skin than adults can. I consulted with my pharmacist in Germany to pick the right formula for my 4-month-old daughter. Initially I was interested in La Roche Posay’s Anthelios Dermo-Pediatrics SPF50+ but was advised against it. Even though good for sensitive skin, Mexoryl (which is the sunscreen agent in all Anthelios products), is a chemical sunscreen and therefore not appropriate for baby skin. My pharmacist recommended Eau Thermale Avene’s Sunscreen SPF50 instead, which literally looks like pure zinc paste on my daughter’s skin. Another popular sunscreen for babies is “Blue Lizard Australian Sunscream Baby, SPF 30”. We all need some sun for the body to make Vitamin D for strong bones and for our immune system, but do babies get enough Vitamin D if they are kept out of the sun? New research shows that infants that are exclusively breast-fed may not get enough Vitamin D. This does not mean that you should expose your baby to the sun – the risks outweigh the benefits by far. But rather, it is recommended to give baby a Vitamin D supplement of 400 I.U. My pediatrician prescribed Enfamil’s Tri-Vi-Sol Drops with Vitamins A, C & D. This should be continued until baby is able to drink at least 32 oz of Vitamin-D fortified infant formula per day. Formula-fed babies seem to get adequate amounts through the fortified formula. My question to my fellow moms: Which baby sunscreen product and other sun protective items do you recommend?